It wasn’t easy, but the Yankees staved off elimination in the AL East race last night. The Red Sox’s magic number is two, so if they win one game this series, it’s over. They’re division champs. No one wants to see them celebrate the AL East title at Yankee Stadium. Tonight the Yankees will try to make the Red Sox wait another day to clinch. It is warm, humid, and cloudy in New York. There is some rain in the forecast later tonight — the internet tells me it’ll start around 10pm ET and continue until about 1am ET — though it’s not supposed to be anything heavy. Hopefully there’s no delay. First pitch is scheduled for 7:05pm ET and you can watch on YES locally and ESPN nationally. Enjoy tonight’s game. Injury Updates: Turns out Austin Romine was not available yesterday. He woke up with a stiff neck. Romine said he feels better today and expects to be available tonight … in case you missed it earlier, Aroldis Chapman (knee) was activated off the disabled list. The Yankees are up to 37 players on the active roster (20 pitchers, 17 position players). Rotation Update: Aaron Boone said the Yankees have started discussing their Wild Card Game starter “in earnest.” The last 12 games of the season could factor into the decision, as could matchups. 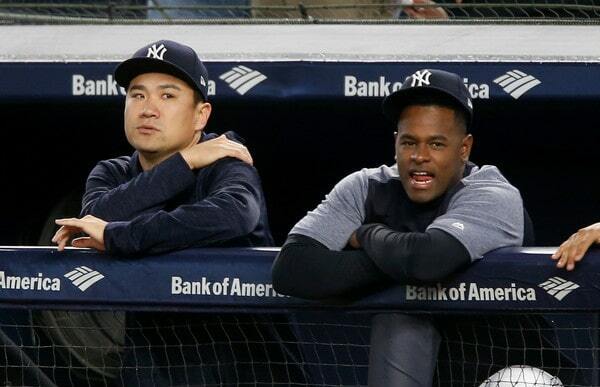 My guess is Masahiro Tanaka starts the Wild Card Game with J.A. Happ lined up for Game One of the ALDS, should the Yankees advance. Most of RAB readers think Tanaka should start the Wild Card Game.